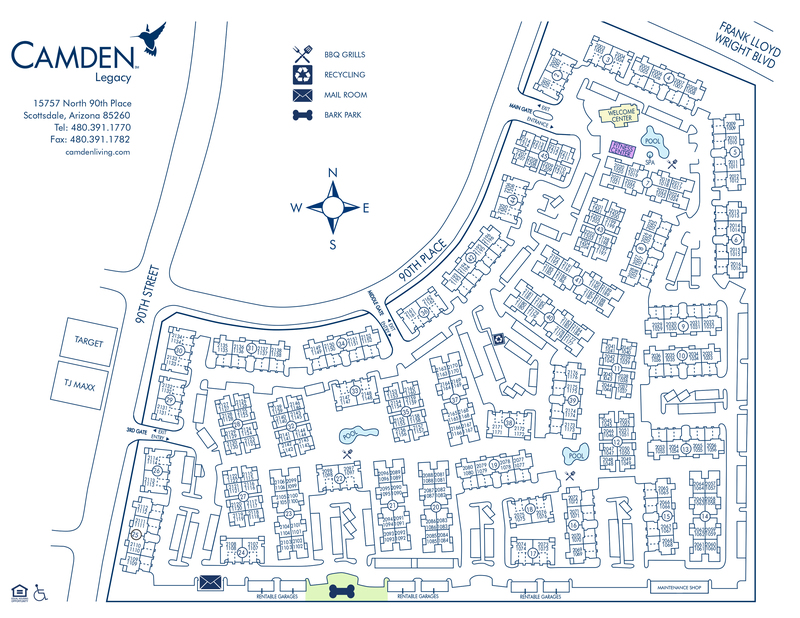 Experience the best of North Scottsdale apartments at Camden Legacy. Unmatched in location and luxury, our one, two and three bedroom apartment homes define comfortable living. With brand new divinely designed finishes in select apartments, attention to detail is evident throughout. Our bright and spacious open floor plan apartments feature large kitchens with all new white quartz countertops, a glass cooktop stove, Whirlpool stainless steel appliances, white subway tile backsplash, modern greige cabinets and hardwood-style flooring. Every home offers a full-size washer/dryer, large walk-in closets, and private patios for your very own outdoor sanctuary. Cool down in Camden Legacy’s palm tree-surrounded pool, hot tub, and BBQ grill. Our lush, pet-friendly community includes a private, onsite dog park so every family member can feel at home. Additional amenities include a state of the art fitness center available 24-hours for your convenience, high-speed internet and cable package as well as direct-access or detached garages. Our apartments in Scottsdale are nestled in one of the best neighborhoods, Camden Legacy apartments are close to plenty of shopping and entertainment. With Kierland Commons just a few miles away, spend your time outside of your apartment shopping or dining at more than 50 restaurants and retail stores. Take in a day of golf at McDowell Mountain Golf Club or check out what’s happening just minutes away at TPC Scottsdale Champions Course. WestWorld is another great option for entertainment just a few miles away where you can enjoy festivals and events all year long. Minutes from 101 FWY, commuting just got easier as you're now only minutes from where you need and want to be. We invite you to take a virtual tour and contact us today to uncover your dream home! We'll save a spot for you! We offer one covered parking space per apartment home, either carport or direct access garage. Additional uncovered parking, garages and carports are available upon request through the leasing office at an additional cost per month.